Yes, it’s still PEI Week. which is why I have nothing to say. You’ve witnessed wine production from coast to coast this year Carin! I can only imagine in PEI, the vineyards are neat as a pin, as everything else there! I love PEI too Carin. Among other treasured memories, it’s where I learned to prepare mussels … the proper way. This sign is such a wonderful example of a the creative practicalities of that gorgeous little island. Yes, that’s it. I love this for its unassuming simplicity. Refreshing. Shall I make them for you next visit? I want to know the proper way too! As to eating them, a very cool girlfriend of our son’s in Paris (back when he was at the Sorbonne) assured us that using the shell of one mussel as “pinchers” to pluck out the flesh of the next mussel was the proper way. Hmmmm. Any opinions out there? The photo, yes, the photo, an excellent wordless shot, wordless in the manner of the likes of us at any rate and love it! About the preparation… all I know is that scrubbing and removing the ‘beards’ is important, so any and all inside info encouraged! What rendered me speechless, really, was that they grow grapes and make wine on PEI! They do in New Brunswick too but it is really “table wine” and I imagine it is in PEI too. I think Nova Scotia is about the limit for winemaking with any claim to seriousness. 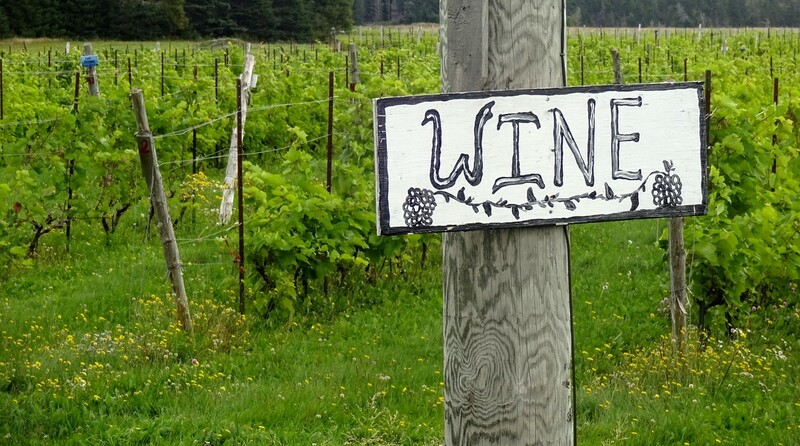 I love the sign though, and the wabi sabi vineyard. Oh I love the term wabi sabi. How have I never heard that before? You word merchant, you! I’m going to say it all day now.